Scientists at the U.S. Department of Energy's (DOE) Brookhaven National Laboratory had just finished an experiment with a two-dimensional (2D) structure they synthesized for catalysis research when, to their surprise, they discovered that atoms of argon gas had gotten trapped inside the structure's nanosized pores. Argon and other noble gases have previously been trapped in three-dimensional (3D) porous materials, but immobilizing them on surfaces had only been achieved by either cooling the gases to very low temperatures to condense them, or by accelerating gas ions to implant them directly into materials. "We are the first team to trap a noble gas in a 2D porous structure at room temperature," said Anibal Boscoboinik, a materials scientist at Brookhaven Lab's Center for Functional Nanomaterials (CFN), a DOE Office of Science User Facility where part of the research was conducted. 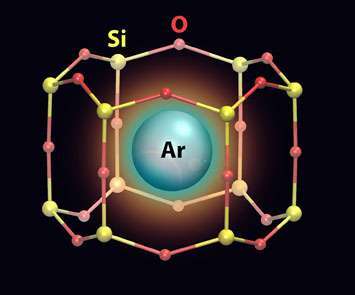 To confirm that the argon atoms were trapped in these "nanocages," the scientists exposed the 2D material to argon gas and measured the kinetic energy and number of electrons ejected from the surface after striking it with an x-ray beam. They performed these studies at the former National Synchrotron Light Source I (NSLS-I) and its successor facility, NSLS-II (both DOE Office of Science User Facilities at Brookhaven), with an instrument developed and operated by the CFN. Because the binding energies of core electrons are unique to each chemical element, the resulting spectra reveal the presence and concentration of elements on the surface. In a separate experiment conducted at the CFN, they grazed a beam of infrared light over the surface while introducing argon gas. When atoms absorb light of a specific wavelength, they undergo changes in their vibrational motions that are specific to that element's molecular structure and chemical bonds. In another infrared spectroscopy experiment conducted in Brookhaven's Chemistry Division, they explored how the presence of argon in the cages affects the passage of carbon monoxide molecules through the framework. They found that argon restricts the number of molecules that adsorb onto the ruthenium surface. "In addition to trapping small atoms, the cages could be used as molecular sieves for filtering carbon monoxide and other small molecules, such as hydrogen and oxygen," said first author Jian-Qiang Zhong, a CFN research associate. While their main goal going forward will be to continue investigating zeolite catalytic processes on the 2D material, the scientists are interested in learning the impact of different pore sizes on the materials' ability to trap and filter gas molecules. "As we seek to better understand the material, interesting and unexpected findings keep coming up," said Boscoboinik. "The ability to use surface-science methods to understand how a single atom of gas behaves when it is confined in a very small space opens up lots of interesting questions for researchers to answer."